Corporate branding and identity starts with a uniform, hat, or simply a shirt. Have your employees look the part and become brand ambassadors at special functions, gatherings, and trade shows. High-quality and consistency is what sets us apart. Family reunions, club gatherings, birthdays, retirement parties and more. Nearly any get-together can be more festive with the proper attire! High-quality shirts, hats, and more are just a call away. Sports Teams! Everyone knows that teams that look great, play even better. Get your uniforms and gear with us so you can look great and get a good deal. Police, Fire, EMTs love coming to us for their uniforms because we do a great job every time. Our products are durable and rugged enough to withstand extra use and washes. 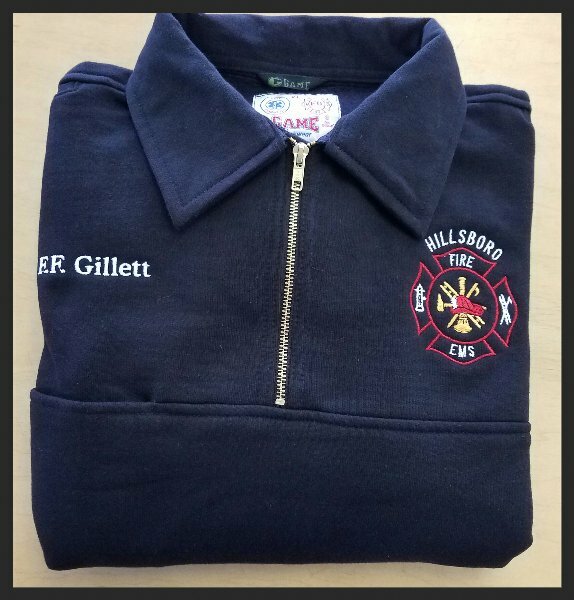 Consistent quality and exceptional service are the reasons why we have enjoyed over 30 years of success as Hillsborough’s best custom embroidery shop. We will meet your high expectations by delivering our creative solutions through our use of the best technology for your project. Looking for the perfect gift or a personalized item for yourself? Get your name or initials on a shirt, jacket, bag, ​blanket, and more. Perfect for social clubs and family gatherings, essential for sports teams, corporate swag, uniforms, and first responders. Names for as little as $3.00. Our graphic designer can make almost any idea a reality. Contact us today for a free quote. On time and on budget...and our clients love us! Right now I'm in love with this place. I had a small (100 copies) rush printing job for an event tomorrow, which I had planned to take to a big chain office supplies and copying place because of the short turn-around. They wanted to charge me 30% extra to get it within 24 hours. I walked out, and called Speedy Printing at 4:45 on Wed. just to see if there was any way they could sneak my job in. Not only could they sneak it in, their price for it was slightly less than the 48 hour turn-around for the other place. I picked it up at 4:45 today, and the results were exactly as I expected. Great attention to detail, and even better customer service. The people of Speedy Printing & Copying/Bridge & Byron Printers are friendly and professional, ready and willing to work with you and fulfill your printing and copying needs. Our office has been a client for several years now, and I am always happy to work with Speedy, knowing they will do their best for us. Would definitely recommend. Speedy Printing is great to work with. Our school uses Speedy Printing for newsletters, brochures, and letterhead. The staff is professional and responsive and as the name suggests, speedy with turn-around. Highly recommend. We've had a chance to wear and wash several of the apparel pieces that you did for us and I wanted to tell you how pleased we are with the sizing and quality of the items. Thank you for taking the time to help us find what we were seeking and for the great customer service! I just wanted to thank you for the amazing job you did on our scholarship night programs. The paper was so professional looking and the quality as wonderful as it always is when ordering from Speedy printing. Couldn't have been happier! We provide quality, fast printing and copy services for local businesses in need of business cards, postcards, flyers, brochures, stationery, and promotional products like hats, shirts, pens, water bottles and more.